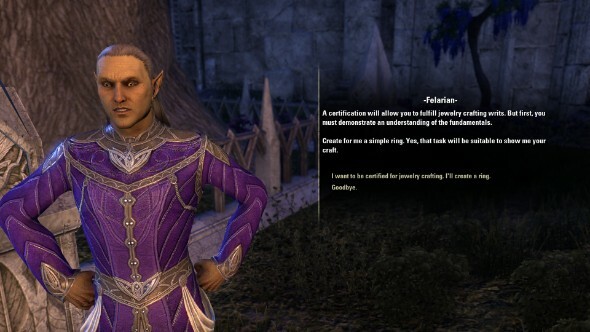 We have been kept waiting a long time for a Jewelcrafting profession in The Elder Scrolls Online but, finally, with the new Summerset expansion, the blessed day of deliverance has arrived. The new jewelcrafting skill will let you craft rings, necklaces, and decorations, and also research new traits for your jewellery. It’ll put a sparkle in your eye. 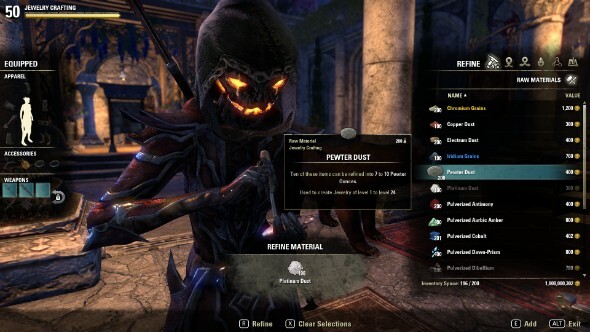 You’ll only find the jewelcrafting NPCs, vendors, and crafting tables on Summerset Isle, and, at the moment, there’s no handy quest marker showing you where to go. Thankfully, we’re here to give you a quick rundown on how to get started with Jewelcrafting. 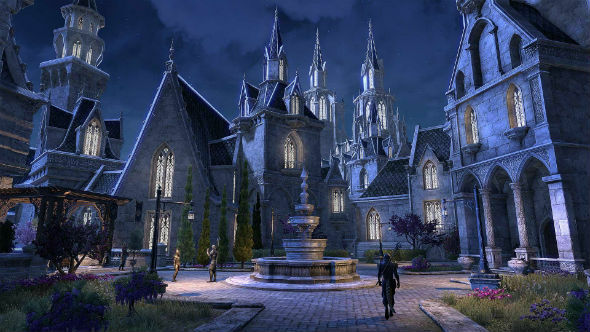 Read our impressions of the Summerset beta here. First things first, you’ll need to hike your way over to the town of Alinor in the bottom-left corner of Summerset. It’s tucked away behind a mountain range so just follow the westbound roads down the coast. 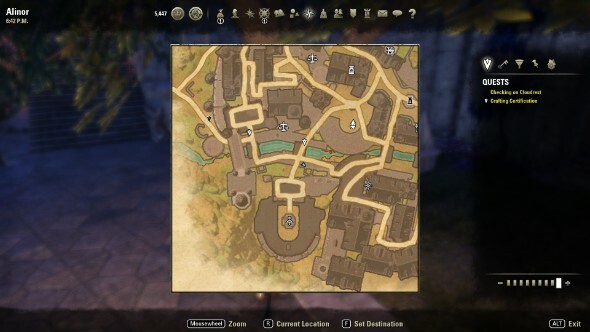 Once you arrive in Alinor take a look at your map. The southernmost marker is the crafting hub, with tables and vendors for all the crafting skills, including jewelcrafting. Just outside this hub, next to the river, a high elf named Felarian will task you with the creation of a simple ring. Once done, he’ll grant you jewelcrafting certification. Here’s where you turn raw materials into useful jewelcrafting items. The main refined materials you’ll need to be aware of are Ounces, the base material needed for creating jewellery, and Plating, which is used to upgrade jewellery. In addition, there are various other refined materials that are used to imbue your creations with specific traits. This is where you make necklaces and rings. The main material (an Ounce, refined from various rare materials) can be used in different quantities to get different level items. The secondary material determines the item’s effect. Depending on which material you use, it can boost your stats, increase damage, or improve damage resistance, among other handy traits. On this tab you can destroy the leftover jewellery loot you’ve amassed in return for useful materials. If you don’t care about money, it’s a good way to funnel your excess loot into something productive. Here’s where the Platings come into play. After you create an item you can boost its item grade from Normal all the way to Legendary. You use Platings for a chance to upgrade items (Terne for Fine, Iridium for Superior, Zircon for Epic, and Chromium for Legendary), with a better chance of an upgrade the more Platings you use. You can make Plating in the Refine tab using Grains – a raw material you can get from veins in the open world. You need to research specific traits before you can use them. You can research any given trait for use on your future creations as long as you own an item that carries it. Researching takes time, mostly to slow down advancement so advanced players can’t get them all right away, but it probably doesn’t hurt that it also encourages the purchase of speed-up items from the premium store. This tab is all about constructing furnishings for your various properties. Most of the recipes use familiar materials and skills used in other crafting categories, and give you a wide variety of decorations, furniture, and other knick-knacks. And that’s it! Go forth to Summerset and make shiny baubles, heroes of Tamriel!